Two different events were discussed and documented by the leadership of the TOC-Kallinikos and the RTOC under Archbishop Tikhon of Omsk, but unsurprisingly both dealt with the elevation of Bp Akakije for the TOC of Serbia by the RTOC: the former with the reorganization of the TOC mission in Serbia, the other with a description of events after the elevation of Bp Akakije by the RTOC. The hieromonk claimed that the TOC-Kallinikos had no intention of ever ordaining a candidate for a restored Serbian Church, while the TOC-Kallinikos has responded by claiming that Hieromonk Akakije was guilty of schism and conspiracy. The documents indicate radically different perspectives of the same years in question as well as recent events and therefore we refuse, as always, to take sides on the matter. Sadly, the documents reflect that the possibility of union between the TOC-Kallinikos and the RTOC has reached a new low. 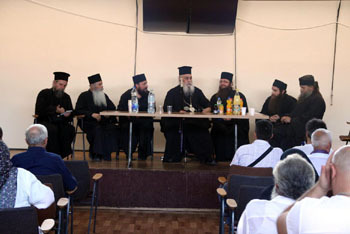 On Saturday August 21st/September 3rd 2011 the Belgrade General Clergy-Laity Synaxis of the GOC Serbia convened under the presidency of His Beatitude Archbishop Kallinikos of Athens and all-Greece. All of the clergy who serve in Serbia and Bosnia were present: Hieromonks Methodios Zaharic and Charalambos Bukovic, Priest Slavisha Lekic and Hierodeacon Joseph Mikic, as well as those Serbian clergy who accompanied His Beatitude the Archbishop from Greece, Hieromonk Averky Zlatkovic and Priest Athanasios Kristic and Archimandrite Kassian Angelov and Priest Martin Stanchev from Bulgaria. The massive presence of Serbian G.O.C. (several of which remained until the end of the four-hour session) verify that some 2/3 of the faithful remain committed to the canonical order. 1. Expressed absolute condemnation of the arbitrary, sectarian and separatist actions of three clergymen and a small group of laity who followed them in order to flee unto the Russian Synod under Archbishop Tikhon so that one of them may be ordained a Bishop. This faction does not represent the voice of the G.O.C. of Serbia. 2. It affirmed the loyalty of the majority of the Serbian G.O.C. to their canonical ecclesiastical leaders, that is, the Holy Synod of the Church of the G.O.C. of Greece, who from the beginning was responsible to reestablish the Church of the G.O.C. of Serbia. 3. It decided to reestablish the Serbian Church as the “Church of the G.O.C. of Serbia”, a title which it bore from the beginning and which even the those who are now divided used a few months ago before changing it. 4. It decided to reestablish the ecclesiastical council of the parish of Belgrade (with -now- Hieromonk Joseph Mikic as serving priest) according to the new reality; of Smenderevo (with Priest Slavisha Lekic), to establish a parish and ecclesiastical council for Sambac (with Hieromonk Charalambos Bukovic as serving priest) and the convocation of a council in Pirkovtsi, Bosnia (with Hieromonk Methodios Zaharic as serving priest). After the reorganization of the parishes and ecclesiastical councils, the central coordinating body will operate which will really and without compulsion express the will of the clergy and people of the Church of the G.O.C. of Serbia and will operate based on a set of by-laws. 5. It started the processes to find a proper place to build the central ecclesiastical offices in Belgrade, also for the agreement of certain lawyers so as to found an appropriate legal person for the protection of the religious properties and the defense of the religious rights of the Serbian G.O.C. The next day, Sunday August 22nd/September 4th 2011 His Beatitude and those clergy present concelebrated in the church of St. Steven Miloutin, in the city of Smenderevo in the presence of many faithful who were able to attend. Report RTOC Synod Chairman of the Synodal Commission for Dialogue with the different parts of the CPI and the ROCOR Bishop Hermogenes on the outcome of the meeting with Bl. Archbishop Kalinnikov and representatives of the Synod of the HICP, which was held at the Monastery of SS. Archangels (Corinth, Greece), August 12, 2011, and its conclusions on the relevance of the HICP aid in the restoration of the Serbian bishops. Receive our delegation took the Greek side on August 11. We met Bishop Photius on the road to Corinth gave us the opportunity to visit the tomb of the blessed memory of Archbishop Chrysostomos of Athens newly-Hellenic and in Megara, and lift up our prayers to the Lord as the repose of the souls of Vl. Chrysostom, and his prayer predstatelstve in bringing together the True Orthodox Church of Greece, Russia and Serbia. As we remember, Archbishop Chrysostomos was a sincere supporter of the union of our churches and really wanted it accomplished during his life and left his blessing to a bishops synod HICP, according to their own testimony. His Beatitude Archbishop Kalinnikov met us at his monastery in the evening the same day, and warmly welcomed us. Was a day of memory of its patron saint St. much. Kalinnikov and all day he received congratulations from the bishops, priests and laity, so convenient opportunity for a conversation that day was not. Nevertheless, it led us to Bliss Church of the Holy Archangels, opened the Holy Doors, invited to venerate the Holy See. The meeting and conversation with the Greek bishops were appointed by the next morning. While talking to the Blessed. Arch. Kalinnikov by the HICP, was also attended by Archbishop Chrysostomos (Attica), Bishop Photius, the Secretaries of the Synod and the translator. On our side, I was involved, Bishop Hermogenes, and archpriest Victor (Melikhov). As a witness of the position of the HICP, and their decisions to participate in the conversation was invited Shiieromonah Akaki (Stankovic). By agreement of the parties conducted the transcript. Arch. Kalinnikov kindly provided me the opportunity to present our proposed goal of the meeting and freely, for quite a long time, fully express our vision of the development of relations between our Churches, as well as inform about the events of mutual communication between the HICP and the RTOC. At the beginning of the conversation I thanked him for his warm Bliss, fatherly welcome extended to our delegation, and said that his mission to understand my powers are very complex, as I will explain the canonicity of our actions and to convince the Greek side in the purity and sincerity of our intentions in the new already have grown, the circumstances of communication Greek, Russian and Serbian CPI. The absence of understanding of these conditions can lead to a crisis in our relations. According to the approved plan, Archbishop Tikhon talks me at first, it was the opinion of our Synod that we believe a dialogue with the HICP successfully developed to date and endorse the view expressed on the eve of the meeting, the proposal of the Greek side to accelerate the establishment of Eucharistic communion on the basis of progress following the February meeting in Odessa, mutual recognition of identity confessional and ecclesiological positions of our churches with a strong doctrinal points akriviey in ecclesiology and the possibility of oikonomia in matters of the canonical order. I then briefly recalled and described the Greek side continued the foundation of our ecclesiology, conducted in the following theses. Main, the key issue of dialogue between the Greek and CPI RTOC is mutual recognition of their right and duty to see themselves exactly the Local Churches, the right to build relationships that follow the rules of the Universal Church, and to restore the sanctified in the Holy Spirit is formerly the historic fraternal communion between Hellas and the Russian Church. We, as well as the HICP, testify that the Orthodox Tradition can not accept the mysteries of heretical and schismatic churches, and we do not recognize as valid sacraments performed outside the Church of Christ. In the rites of reception into the True Church, the sacrament of baptism and anointing is just a question of admissibility economia not inconsistent with the canons and practice of the universal Church. Synod of the RTOC stores full of Orthodox tradition – as it has traditionally maintained the pre-revolutionary Orthodox Church and ROCOR. From this we keep in rites of reception of the ecumenical Churches traditionally installed in the ROC opportunity to noncanonical economia oblivatelnomu baptism in agreement with the 95 Ave. Trulskogo Council, but with proper study of all the circumstances of its commission in the form of widespread now arbitrariness and neglect as to rank the announcement, and in the commission of the water of baptism. Confirmation of acceptance by the ecumenical official of the Orthodox Churches is the norm akrivii. The practice of anointing is already in our Church, and bound it will be approved at the next Council RTOC. But the conditions for a possible mass conversion of ecumenism and Sergianism in Russia demand at the moment the possibility of applying oikonomia in the requirement of Anointing – by the decision of the Bishop. Next to the Greek side had openly expressed our vision of the negative factors that prevent the early achievement of full communion of our Churches. Firstly, we foresee significant difficulties in the Synod of the HICP in reaching an agreement of their clergy and laity on the issue of admissibility of the RTOC in the rites of reception oblivatelno oikonomia in ecumenical churches baptized in connection with the already traditional in the mid-18th century in the Greek Church akriviey in relation to baptism oblivatelnomu . This practice of the Greek Church still insufficiently substantiated by the norm of the Universal Church and not accepted in local churches are not following the Greek Pidalionu. In this respect, our guards that details of the RTOC to flock in the HICP is still not yet been brought and the proposal to accelerate the achievement of full communion of our Churches are not supported by the visible internal processes in the HICP. Secondly, we can not agree with the Synod of the HICP, the legality of his church spread their administration to the historical canonical territory of other historic local Churches. This is a question of the existence of the HICP is not yet abolished the Exarchate of the Russian and the known facts of the actual church policy toward the Serbian CPI. It has become clear beyond doubt split applications HICP of his ecclesiastical policy with respect to the Serbian CPI. It is known that there were long-term assurances that the HICP is a sister church to the HICP, and are known at the recent statements of the Synod, said that the HICP HICP until only its mission in Serbia. In this regard, it is clear that the term “CPI in Serbia” is not identical to the concept of “CPI Serbia”, and by the HICP, it is a real canonical legality of his administration in Serbia. On a recent claim of Serbian clergy and laity to the Synod of the HICP to confirm their historical rights and the restoration of Orthodox autocephalous Serbian bishop to ordain them followed by a formal confirmation of the canonicity requirement recovery Serbian Church authorities with no real prospects for his performance in the foreseeable future. Thus, a necessary condition for self-government agreement on the HICP delivered recognition and registration of the Serbian state. In Russia, the need for this clearly would be called “sergianism.” In addition, the HICP HICP declined elect (those who are aware of himself is one) candidate for the Bishops Shiieromonaha Akaki, its undisputed spiritual leader, and instead offered the Serbs only a candidate for election to ordain him to the uncertain future of Bishops is in the HICP for Serbia . Criterion necessary for the Diocese of the strength of the CPI Serbian Greek Church in no way justifies, but said that there was insufficient number of members of the HICP for now ordain Bishop. All of this to us, as well as Serbs, it seems artificial confinement Serbian CPI for his tough administration indefinitely its administration in Serbia. In this proposition, we rely also on the statement by the Greek side, which had been in place a telephone conversation between Bl. Arch. Kallinikov and Archbishop. Tikhon. Them which we have previously reproach, that we do not own situation in the HICP and interfere in the internal affairs of the HICP, I can answer that we did not create the existing division between a small group, consider themselves members of the CPI in Greece, and a large enough group of self-aware is the CPI Serbia. We found this separation has long existed, and the reasons for this lie in the policy of the HICP. We learned quite a spiritual life in a large group gathered around Fr. Akaki to see him as a real and prepared candidate to the episcopate. Serbs have been visiting the Lesna Convent, as well – the nuns and the abbess Lesno of Russian Serbian Monastery Novostenik, the monastery went to Archbishop Benjamin, was meeting with the Serbian clergy, monastics and laity in Odessa. For us the obvious fact that it is the Serbian Orthodox patriotism gives enormous power of what is happening in Serbia, the revival of the purity of Orthodoxy and only through him Orthodoxy can get broad support of the Serbian population. At the moment the Serbian question in particular expands and raises the level of our dialogue, revealing the true ecclesiological position and policy of our churches, bringing its resolution, we believe, at the appropriate level in the fullness of the Truth of Orthodoxy. It is the duty of the Orthodox bishops – to observe the canonical ordering of the universal Church, and it does not allow us to remain indifferent to the problems of the HICP, truly suffering for the dying in the heresy of ecumenism Serbian people. Our hearts sostrazhdut most places where a persecuted truth, where the persecuted Christ true of non-Orthodox authorities, supporting heretics. This position is very close and familiar to us in Russia. In Greece today there is no such provision, and the CPI is recognized by the state, even a degree of protection from the official ecumenical Church of Hellas, and, as we see now is not conducive to the fullness of understanding between the Serbs and Greeks. HICP manages a large group of Serbian Orthodox on the canonical territory of the Serbian Church for over 10 years. This not only helps, but even prevents adherence to the CPI of people from the official Serbian Church, and the reason for this is well-known manifestations of Greek nationalism in the history of relations between the Greek and Serbian Churches. In Serbia today needs, as it rightly points HICP its national Serbian Orthodox bishop. And this is not a manifestation of nationalism, which leads to heresy filetizma and orthodox patriotism, promoting on the basis of the deep roots of the Serbian Orthodox national culture Serbian people gather in the eucharistic unity. The territorial principle of separation of control of the Orthodox Churches and has hidden the eucharistic principle, and each is decorated with the national Local Church is unique in its piety, the Holy Spirit. Truth is – it’s not only the formal purity of thought, but the love Christ has commanded us. Love is always compassionate, and we can not but sympathize with fellow Serbian Church. The use of the canons should not stop the gift of life in Christ. On the contrary, they are spiritually directed to rectify the fullness of life in Christ. I am reminded that the Russian Church in the past, as restoring the episcopate HICP, and making confession of his canon, not required in this case from the HICP recognition of the Greek state, and then the Greeks were very pleased by the recognition of only one of the ROCOR. ROCOR did not specify the time of his administration even in Greece, but we still have the Greek administration in Russia. Furthermore, in America, Metropolitan Filaret did not want to subject his administration came to us and offered them the Greek autonomy, from which they refused. Victor O. Melikhov led to this compelling personal testimony and rejected the view expressed by Archbishop Kalinnikov statement that the Russian at the time “pressured” by the Greeks, the demand to abandon the Greek worship, which he himself allegedly witnessed in Boston. It became apparent that, unfortunately, the Archbishop of Kalinnikov may allow subjective and biased news coverage, which was confirmed and later in his account of events the development of relations between the Serbian clergy and Synod HICP during his personal management of Greece. We are aware, I said, with all parties to the HICP and HICP relations for the decisions that are right and duty of the Local Russian Church, as the HICP officially asked us to take them in prayer and fraternal full communion, and we had a frank dialogue on all issues of communication with the HICP, which was launched three years ago. We did not bother the Serbian population CPI, we had the opportunity to get acquainted with its inner life, and we recognize its right to self-inter-church fellowship. We are confident that the group headed by spiritual leader, Fr. Akaki (Stankovic) is the center, enough to speak the Orthodox Tradition of crystallization around the resurgent Serbian national church. Therefore, we decided to establish full of prayer and communion with the Serbian Church, the True, and it is a fait accompli, of which I am instructed to inform the Greek synod. As mentioned in a recent letter to Archbishop Tikhon as a reproach Bishop Photius, worried about the course of our relationship with the HICP and genuinely worried about the successful completion of the unification of our dialogue, we really made a decision about the ordination of our Synod of Bishops for the Serbian CPI, but without diffusing the Serbia in his administration, and wanted a share of the HICP to make this important event in the life of the CPI. We also like the HICP consider it a matter of great urgency. That is, we see the possibility of autonomous existence of the first Serbian bishop with the right to independent decision on the temporary entry of selected them fraternal Orthodox Synod. Our ultimate goal has been raised repeatedly – is a joint witness of Orthodoxy three Orthodox Churches: Greece, Russia and Serbia. However, we are soberly assess the current foreign policy of the church HICP, the possible complications of her concerns with the Greek government during the construction of a parallel of the official Church hierarchy in Serbia CPI and offer to make it from us, with the participation of the bishop of the HICP. His Beatitude Archbishop Kalinnikov listened carefully to all of our message that I bring more meaning, but not up to the letter, and, to his credit, correctly returned to speak to the end. The bishops of the younger generation showed less exposure, and recurring variations in dialogue with them. But in his response, His Beatitude has taken a very tough position, narrowed to the conviction of our intervention in the affairs of the Greek Church. In fact, he dismissed our arguments about the universal nature of the debt recovery hierarchy of the Orthodox Serbian Church. It was even stated that “we gave birth to the Serbian Orthodox church … this is our daughter,” and we get involved in criminal lives of their families. He brought us to the compassionate stance of the Serb desire to help the CPI and CPI Greece to the irony: “I love you, let me now you do the operation!” Its kind of person can understand, as previously reported in the press that he considers himself a Serb Locum Tenens of the Patriarchal Throne. That is why his personal conflict with Shiieromonahom Akaki returning from Mount Athos in Serbia with the dream of saving the Serb people as soon as possible through true Orthodoxy (and not in the CPI, Greece) was inevitable. The statement about “the birth of the Serbian Church” also grates on the ear, as were very long periods of falling into heresy and iconoclasm monothelitism, very tough-supported imperial power, but no one claimed them after he begat new Greek Orthodox church. Archbishop Kalinnikov and especially hot – present Greek bishops – are we persuaded that the inevitable, in their view, the destruction of close to our unity is due to the ambitions of one man on. Akaki, voshotevshego become a bishop. According to Archbishop Kalinnikov, Fr. Akaki was ordained them to the CPI in Greece and sent on a mission to revive the Orthodox Church in Serbia. Since this was a serious canonical moment, we were asked to give an opportunity to respond to this most about. Akaki. As for the floor on. Akaki fully, calmly and firmly, but without prejudice to the Greek side, in Russian, so we knew exactly his speech, strongly refuted the Archbishop. Kalinnikov. He returned to his long-suffering Serbian land from Mount Athos Schemamonk after council with his monastic spiritual father to the deed of prayer for the dying in ecumenism Serbian people. Initially, he had no desire to revive it through a Serbian Orthodox church. But then gathered around him a large group of anti-ecumenists, and they, like himself about. Akaki, saw themselves exactly the Serbian Church. They persuaded him to accept the priesthood for his group of Greek Synod Archbishop. Chrysostom, and ordained him for this purpose, at that time Met. Kalinnikov. But immediately after that they started with the Met. Kalinnikov big problem. He never for a decade does not appear in Serbia, and there were serious problems in organization and management of the Serbian Church, and the biggest is that management is not in Serbia. O. Akaki was openly accused of the Archbishop. Kalinnikov in the division of the Serbs, initially gathered around the community about. Akaki. In the end, the insistent demands of Serbs to another bishop, began to come to Serbia En. Foty Marathon. There was controversy, and the Greek bishops were accused of emotional enough. Akaki, it is not the person who can unite all Serbs in the CPI, Greece. But it is quite understandable, since all the problems arose because of the commitment and focus on. Akaki serve the interests of the Serbian Orthodox Church is in its canonical territory, but his opponents appear because of the impact on them was the Greek bishops of the Church. During the debate it became clear that among themselves the Greek bishops had previously put forward the candidature of a bishops. Akaki. This confirms the motivation of the rejection of his candidature to the Bishops at the present time due to the long-term policy on hold HICP HICP in his administration, which prevents the self-determination for its clergy and laity in their efforts to serve the interests of the Serbian Church. For its part, the result of dialogue with the Greek bishops, I believe that the current split in Serbia in the HICP and HICP supporters created an erroneous canonical (missionary territory) and ideological (“Great idea” spoofing the Universal Church of Greece) a group policy of Greek bishops, with the leadership of the current Archbishop Kalinnikov, not a bug, or spiritual damage on. Akaki, we are taught that the Greek side. It is the duty of fraternal Local Church – to excel in love, and not much to the primacy of power, and as soon as possible to restore the church hierarchy in a country with deep roots and the Orthodox Tradition of the Church the fullness of stores in their worship and religious ceremonies in their native language. Greek Orthodox church during the Turkish slavery, as we know, has got up to the same wrong path, and Phanar based on the Turkish authorities deprived the self-management, deprived of the patriarchate, even autonomy Balkan Orthodox Church. Canonical violence negatively perceived by the Greek Church Serbian, Montenegrin, Bulgarian, Romanian, valahskim people as well as the Turkish yoke. Alive the memory of deprivation 200th Patriarchate of Serbia in 1755, then – the abolition of Pec and Metropolitan of Ohrid. The bishops of the Serbs and Bulgarians deposes and replaced by the Greeks. Phanar has pursued a policy of making the universal Church to the Greek, so even the shade of such a policy in Serbia is perceived negatively and is an impediment to the transition into the CPI under Greek control. In Serbia, the transition due to the ecumenism of the official Church is the Greek Orthodox church is very difficult not because of Serb nationalism and the Orthodox for a healthy patriotism. To date, there is a situation the need for assistance veshatelstva RTOC HICP HICP as obstacles to overcoming the split by a genuine and active recognition of the Serbian CPI and connection of all Serbs in the self-governing church. In contrast, HICP deepens the division, offering to overcome this conflict by refusing to give a long HICP independence until completely impossible conditions – recognition of the HICP from the government (in addition, it is simply non-Orthodox) and the apparent rejection of candidature of the leader of the HICP. Akakaios.